Is Online Poker Legal in Texas in 2019? You're Damned Straight It Is! 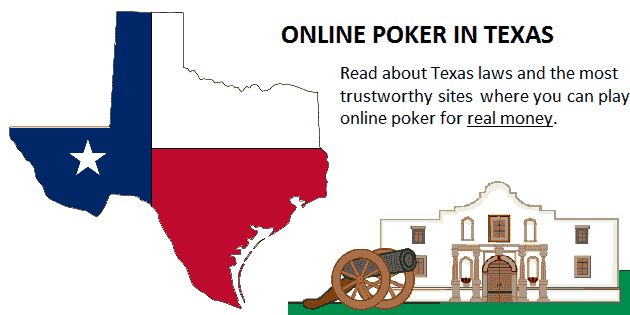 Texas is one of the largest states in the United States by both land mass and population, and many of its residents are interested in Texas online poker. One thing Texas is not known for though is its gambling despite a long and distinguished history of cowboys and outlaw behavior as well as the fact that the most popular version of poker, Texas Hold'em, gets its name directly from this state. The current political climate of the state makes the distinct legalization of online poker in Texas a longshot at this time. The citizens of Texas shouldn’t fret about having access to Internet poker or other forms of Internet gambling, however, as there are a plethora of legitimate offshore poker sites offering their real money services to this great state. Not only do these sites offer Internet poker, but many of them also offer sports betting, casinos, and racebooks. The hope of regulated online poker and gambling is not the only solution, and offshore sites are here to show you that. Below are a list of the great online sites available to those in the state and the thrilling games they have to offer. If you are from Texas, there is no need to worry about the unfavorable political climate of your state! What Online Poker Sites Can I Play in Texas? There are many online gaming choices for Texas players, but not all of them are up to par. We've gone to the trouble of winnowing them down to only those sites that are reputable and competent. When you choose to partake in online poker in Texas at one of our recommended rooms, you'll get to savor exciting gameplay, fair card distributions, and rapid payments of your winnings. Read the information we've presented below, and then pick a site and sign up. There's a reason why Ignition Poker heads up our list of the best internet cardrooms for Texans, and this is because it has the largest cash game traffic of any U.S.-facing poker site. Besides just having a lot of games to pick from, you'll also get a valuable 100% up to $1,000 poker bonus, which will return back to you 30% of the fees you pay to enter tournaments and SNGs along with a somewhat smaller percentage of the rake you pay in ring games. Ignition is housed on the PaiWangLuo Network, descended from the old Bodog Network, the creation of Canadian billionaire Calvin Ayre. This used to be an also-ran in the internet poker industry, but it deployed elements that have led to the rapid growth of the room. Among the most prominent of these is the anonymized gameplay: You aren't identified by screenname here, and neither are your opponents, which reduces the negative impact that tracking software and bum-hunting have on game quality. Cash games here run from $0.02/$0.05 up to $10/$20 in NLHE, PLO, and PLO/8, and they go up to $30/$60 for LO8 and LHE. There's a fast-paced type of cash game called Zone Poker, which you won't find at any other virtual poker site that accepts Americans. When you fold your hand in a Zone game, you don't have to wait around for the next one to begin because you'll be transported immediately to a new table and receive another set of hole cards. You can play many more hands in the same amount of time at a Zone table than you could at a regular poker game. There are many tournaments throughout the week at Ignition, and they guarantee more than $1.5 million each week. The most notable such tourney is the $100,000 guaranteed, which runs on Sundays and costs $150 + $12 to enter. Frequent MTT series, like the Super Millions Poker Open, hand out millions of dollars in prizes across myriad events. If sit-n-goes are more your speed, then you'll like the fact that they're present here from $1 + $0.05 to $200 + $14. There's also a unique Triple-Up SNG format that pays one-third of the field three times their buyin. Don't overlook the Jackpot Sit & Gos either because these lottery style contests give you the opportunity to contend for a prize pool 1,200 times what you paid to enter should the right randomized multiplier be selected. You can access the poker room from your Windows machine or Mac using the download application. Mobile is also supported although most SNGs and all tournaments are absent. The attached mobile-friendly web casino contains hundreds of games for when you wish to take a break from poker, and you're eligible to receive a matching 100% casino bonus on your initial deposit up to a total of $1,000. The best part is that you don't need to make a separate deposit; you can claim both poker and casino bonuses at the same time. To join Ignition Poker today, you can click the banner above to get the best possible deposit bonus! Or read our thoroughgoing Ignition Casino Poker review page for further details on this top-notch online poker firm. The Sportsbetting.ag site on the Chico Poker Network is a solid place to go for online poker, and its room is inhabited by soft crossover traffic from the attached sportsbook and casino operations. It's now the third-largest place for online poker in the United States. Upon making your first deposit, you'll qualify for a 100% up to $1,000 bonus that's worth 20% rakeback. The ring games at SB.ag are almost entirely composed of No Limit Hold'em and Pot Limit Omaha although there is a smattering of Pot Limit Omaha Hi-Lo too. The stakes run from $0.05/$0.10 up to $10/$20, so you can find a limit you're comfortable with unless you're really a high-roller. The Sit-n-go lobby is pretty packed with contests firing off periodically from $1.50 through $200 + $15. Multi-table tournaments aren't as promising, though, with most of the lineup priced at $33 and below. There is a weekly $90 + $9 Main Event on Sunday that guarantees $50,000, and this is boosted up to $100 + $9 and $100,000 guaranteed on the last Sunday every month. The newest entrants to the Chico Poker lineup are fast-fold Boost ring games and lottery Windfall sit-n-go tourneys. Boost hasn't proven as popular as initially hoped, and it's not available except at the micro-stakes. Windfall has had more success and can be enjoyed at four distinct buyin levels. Poker download clients are provided for Mac and Windows while mobile apps for iOS and Android let you play while away from home. This solution for tablets and smartphones is one of the best we've ever seen because it allows you to access cash games, SNGs, and tournaments, and it contains advanced functions, like multi-tabling and smooth animations. There are several ways to build up your rewards earnings at Sportsbetting.ag. First of all, there are contests for SNG and cash gamers that pay out in real money. Secondly, you can trade in the comp points you collect while playing for tourney buyins equal to about 5% of the rake you've paid. Finally, if you take a seat at a special Bad Beat Jackpot table and trigger a big payout, you could receive a six-figure score! If all of this appeals to you, then don't hesitate; follow the banner link above to register your new Sportsbetting.ag account. To get a better idea of this site's poker product, browse over to our detailed Sportsbetting poker review. There's another site on the network called BetOnline, which you may wish to investigate further too. Bovada is a sister site of Ignition, and so the poker games are all the same. Yet, this may be a better choice for some gamblers because it has a sportsbook and racebook in addition to the poker room and casino offered by Ignition. Bovada's poker bonus is smaller, however, at just 100% up to $500 rather than the $1,000 possible at Ignition. If you intend to bet on sports, then you'll be pleased by the selection at Bovada. There's baseball, football, basketball, hockey, tennis, and plenty of other types of competitions listed. The focus is on American sports, but there's pretty good coverage of international leagues, like Premier League soccer and Rugby Union, too. You can even wager after a game commences through the Live Betting interface. Bovada grants all new sports bettors a bonus of 50% up to $250, and this climbs as high as $500 if you deposit with Bitcoin. Betting in the racebook will also clear the sports bonus. There are around 200 racetracks listed mostly in the United States. It's possible to make straight wagers, like Win, Place, and Show, along with exotics, like the Daily Double and Pick 4. Bovada pays full track odds. If you're a casino enthusiast, then you may be excited to discover that Bovada has a couple of advantages over the Ignition Casino. There are leaderboards that run for a short period of time at specific games and pay out to the top few players. They cost nothing to participate in, and you could walk away with a prize. Another cool element is the Live Dealer area, where you can enjoy Blackjack, Roulette, Baccarat, and Super 6 tables run by an actual human dealer. When you make your initial casino deposit, you'll get a bonus of 100% up to $1,000, and there are identical bonuses for your second and third bonuses as well, combining for a total of up to $3,000 in free funds. If you deposit bitcoins, the bonus jumps to 150% up to $1,500 for each installment, leading to a bonus total as high as $4,500! To open up your new Bovada account, follow the above link. You can research more about this room in our comprehensive Bovada Poker review. When you're looking for an experienced and trustworthy online gambling location, Intertops is sure to come near the head of the list. It has been serving its clients for more than 30 years, and it's the leading room on the Horizon Poker Network. New account holders are eligible to get a 200% up to $1,000 poker bonus, 36% dealt rakeback, and 100 free spins to use in the casino contained within the poker software. The clearance rate of the bonus depends on the specific games you play, but it can be as much as 27%, which adds on top of the everyday 36% rakeback to give you returns in excess of 60%! Even after you're done with your bonus, you can claim reloads about once a month. The games here are concentrated at microstakes with the largest cash games usually being $50nl - $200nl and the highest SNG running denominated around $5 or even less. Tournaments are similarly small with few events above $20 apart from the daily Sundowner $50 + $5 tourney, which guarantees $1,500 ($2,500 on Sunday). That said, there are some pretty decent time-sensitive tournament promos, like satellites to live poker events and small series that often have nice overlays. There's a rakerace every week that awards $4,000, and it doesn't matter whether you play ring games, sit n' go's or multi-table tournaments because they all count toward advancing in the standings. Because of the relatively small player base here, you needn't grind all day to collect some free money from this race. There's also a loyalty program that delivers free cash awards, and you can read the email newsletter to take advantage of seasonal specials. A lot of gratis cash also awaits you in the various sports and casino promos at Intertops. Click the banner above, and set up your Intertops account now. You may wish to peruse our page devoted to all things Intertops first. As you might deduce from its name, Americas Cardroom is pleased to serve inhabitants of the Land of the Free and the Home of the Brave though it does also accept custom from most other places around the world too. The Winning Poker Network, of which ACR is a member, is the second-largest destination for internet poker in the U.S. market. You can get a 100% up to $1,000 poker bonus that's equivalent to 20% rakeback along with $50 in free credits upon making your initial deposit..
Americas Cardroom was the first site in the U.S. to implement lottery-style sit-n-gos, which it calls Jackpot Poker. It's is a type of three-handed, lottery-style sit-n-go that's common at PokerStars and other sites that serve a global audience. You can play for prizes of up to 2,500 times your buyin based upon a random multiplier. Another exciting SNG variant that includes random elements is SNG 2.0. There are standard sit n' gos too, of course, from microstakes to buyins that cost thousands of dollars. SIt-n-goers earn points toward the Sit & Crush leaderboard, which pays out in cash and satellite entries every week. In the area of MTTs, ACR is pretty strong as well. The Sunday Special ($200 + $15) comes with a $150,000 guarantee, making it the largest such regularly scheduled weekly event open to Americans. Every few months, there's a Million Dollar Sunday, which awards prizes of at least $1,000,000. Throughout the year, series like the Online Super Series allow you to compete for big money in many variants of poker at price points low, medium, and high. If cash games are your specialty, then you'll find an extensive selection comprising NL Hold'em, PL Omaha, Seven Card Stud, Seven Card Stud split-pot, Limit Omaha-8, and Limit Hold'em. This is where the serious money comes to play because the games go up to $25/$50 in big-bet formats and $30/$60 or more in fixed-limit formats, but there are also micro-stakes blind levels available too. Every ring game, apart from heads-up ones, earns you points toward The Beast, a weekly leaderboard that has disbursed no less than $15 million over the course of its existence. There's no extra drop taken for this promo – it's funded through a portion of the regular rake. Start playing at Americas Cardroom by clicking on “Visit Site Now” above. Our Americas Cardroom site review will allow you to educate yourself a bit first if you wish. Just like any other poker network, WPN shares liquidity across several sites. This allows it to act more efficiently than if all the skins were forced to conduct their affairs separately. If you're curious about the other companies on the network, then you can read our reviews on some of the most well-esteemed among them: BlackChip Poker (read review), True Poker (read review), PokerHost (read review). Rakeback is available on this network; to familiarize yourself with how to get it, take a glance through our page devoted to WPN rakeback deals. You may never have heard of the Grand Poker Network, which makes sense because this entity only got off the ground in 2014. Yet 5Dimes, which owns the network, is a famous internet bookmaker that has branched out into casino and poker. Needless to say, all the business dealings of this firm are above-board and honest, and it has been this way throughout the entire lifetime of the organization. Player traffic levels are underwhelming, but 5Dimes is a fine place if you're just starting out and have no real interest in heavily multitabling. Ring games fall within the $0.05/$0.10 to $1/$2 range, and sometimes you'll see pretty soft-looking tables at even the higher end of this spectrum. This makes sense because the people here aren't savvy pros; rather, they're loose casino and sportsbook gamblers who mostly tend to not know much about cards. Tournaments aren't offered higher than $5 + $0.50, but again, this isn't a concern if you're a newcomer to the game or on a limited bankroll. In fact, there are a few ways to try to run up a balance here with a very modest investment. Every day there are several tourneys that don't charge a house fee, so you'll see an instant increase to your returns of 10%. What's more, there's a $500 freeroll every Sunday that doesn't feature terribly large fields. The 50% rakeback that you'll get when you sign up through us will also reduce your expenses as you attempt to grow your financial resources. It's easy to create your new 5Dimes account by selecting the above banner to go to the site, and you can play from a PC, Mac, cellphone, tablet, or virtually any other modern computing system. If you'd like more detailed instructions or an overview of the other network sites, then be sure to examine our Grand Poker Network review. We can't identify the unquestionably best poker room for your personal needs. You'll have to ponder their various advantages and drawbacks carefully to decide which one you think you would prefer. They each emphasize different things and are thus each appropriate for different kinds of players. There aren't any unbreakable commandments when attempting to choose an online poker room, but there are a few points that you'll want to keep in mind while you're thinking about where you want to play. ★ If you're searching for the highest possible bonus amount, then Ignition, the Winning Poker Network, Chico, and Intertops all provide up to $1,000 in bonus funds..
★ If total player volume is your primary consideration, then Ignition, Bovada, and Winning Network have the large number of active tables you seek. ★ If you believe that regular rakeback returns are one of the keys to long-term profitability, then Intertops and Grand are probably right for you. ★ If you're interested in types of games other than the commonplace, then Ignition and Bovada's Zone format and WPN's non-standard sit-n-goes should appeal to you. ★ If you intend to play from your mobile device, then Chico, Ignition, Bovada, and Grand Poker have the solid poker apps you're eager to try out. ★ If you wish to join a site with a robust rewards program, then WPN and Horizon will deliver the kinds of benefits you deserve. ★ If you want to remain anonymous at the tables, then the setup at Ignition and Bovada.lv was designed with you in mind. You can expect to be able to fund your real-money account easily and to receive fast cashouts. This is especially true if you opt for the digital currency Bitcoin. There are sometimes issues trying to deposit via credit card, and traditional means of processing withdrawals often come with significant fees attached. When you use bitcoins to move your money around, you won't be subject to these irritations. All of the sites we've discussed above support this crypto-currency, so you can use it to good effect no matter where you play. If you'd like to learn more about the very safe and very fast method of setting up Bitcoin for deposits and withdrawals, check out this guide. Texas is known to look with disfavor upon gambling in general, and therefore it's pretty much standard to expect the state to have rather severe and comprehensive statutes against the practice. What many of our readers may not be aware of, though, is that these laws are so worded as to leave many exceptions and escape clauses through which online poker played in your own home comfortably fits. The codes that deal with gambling are contained in Title 10 - Offenses Against Public Health, Safety, and Morals, Chapter 47 - Gambling. (3) plays and bets for money or other thing of value at any game played with cards, dice, balls, or any other gambling device. The first two clauses are clearly irrelevant to partaking in card games over the internet, but the third may come into play depending on whether or not the images that appear on your screen are regarded as cards and whether or not a computer counts as a gambling device. In the definitions section of Chapter 47 (47.01), a few examples of gambling devices are given, including roulette, video poker, and keno, and it seems that this wording targets the kinds of machines one would encounter in a casino that are specifically manufactured for use in real money gaming. Your personal computer wouldn't count as a gambling device under this commonsense interpretation of the law; however, we can't say definitively that this is the way TX authorities would view the situation. Similarly, in our opinion, the word “cards” means actual pieces of cardboard or plastic that contain the familiar suit and rank symbols that we're all acquainted with, not virtual representations of those items. Again, it could be possible that local police have a different understanding of what cards are than we do. (3) except for the advantage of skill or luck, the risks of losing and the chances of winning were the same for all participants. As long as you play at home, don't receive any financial gain other than as a player, and don't cheat, you aren't subject to any form of prosecution for playing poker online in Texas. Even if you screw up somehow and fail to adhere to these three rules, you won't get in much trouble. The law continues: “(d) An offense under this section is a Class C misdemeanor.” In the Lone Star State, a Class C misdemeanor is punishable by a fine of no more than $500, and there's no jail time involved. It's different for those actually operating the poker rooms. They could face charges of Gambling Promotion and Communicating Gambling Information. If it's a brick-and-mortar illicit gambling enterprise, they could also be considered to be guilty of Keeping a Gambling Place and/or Possession of Gambling Device, Equipment, or Paraphernalia. Each of these offenses is a Class A misdemeanor, which incurs a fine of up to $4,000 and/or a jail sentence of no longer than one year. Offshore poker sites have retained counsel to help them navigate the complexities of gambling laws in different jurisdictions, and hardly any of them decline to operate in Texas. This makes sense because there have never been any high-profile anti-online poker crusades in the state. The size of the population, at more than 27 million, is also an inducement for them to continue to run internet poker games that Texians can join. 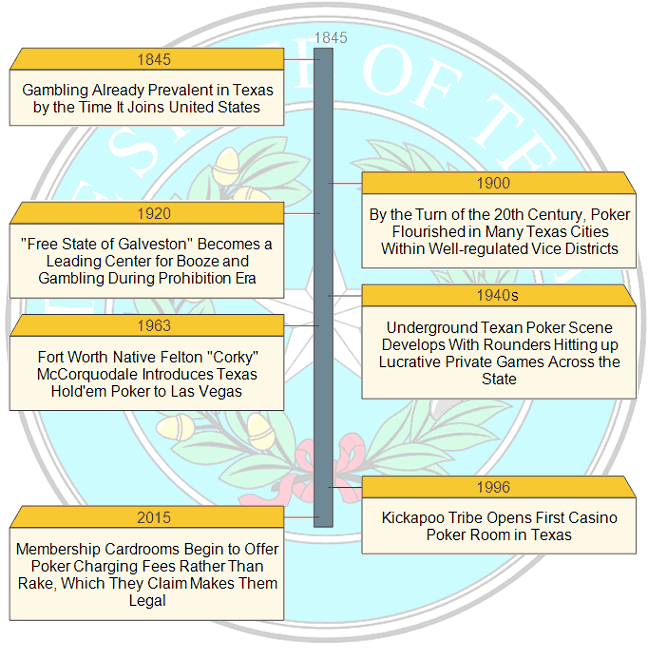 With the most popular form of poker taking its name from Texas, it's a given that the state has had a long and rich history of card playing. After flying both the French and Spanish flags during its early years as a colony, the area was transferred to Mexico after that nation's independence in 1821. Social attitudes toward gambling during this time were extremely liberal with the pastime being considered normal and acceptable for people from all walks of life. Revolutionaries declared independence from Mexico in 1836, and the independent Republic of Texas lasted until it was incorporated into the United States in 1845. There wasn't much to do in some of the towns spread throughout the vast state, which may be why gambling saloons opened up in all but the smallest communities. Lawmen had much better things on their minds than worrying about illicit card games, and so these establishments were left alone unless they made a nuisance of themselves. With so much real-money action occurring throughout the state, professional gamblers found rich recompense traveling from camp to town to city and relieving the locals of their cash. John Henry “Doc” Holliday was originally indeed a doctor, or dentist to be more precise, in Atlanta before taking up cards. He contracted tuberculosis and moved to Dallas in the early 1870s where it was felt that the climate would alleviate the symptoms of his condition. He opened up a practice, but business was indifferent at best, and Holliday soon discovered that he could make more at the card tables than he could wielding his dental implements. He often got into conflicts with other players, many of whom were cheating, and this sometimes escalated into violence. It was one such incident that forced Doc to leave Dallas rather than being captured by the law. He later killed a man in a dispute at a poker table in Jacksboro and had to flee again in 1876. Holliday spent most of his remaining years moving around and frequently getting into trouble with the law. He's most famous for participating in the showdown at the O.K. Corral in 1881. 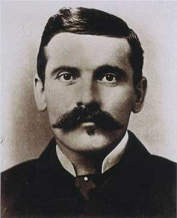 Doc Holliday ended up succumbing to tuberculosis in 1887. Carlotta “Lottie Deno” Thompkins was a wealthy, redhead Kentucky heiress who lost her money through high living during a trip to Detroit in the 1860s. Her father had died as a soldier in the Civil War a few years earlier, but before that, he had taught her how to gamble at cards, and it was this skill that she used to earn her bread. After some time spent on the Mississippi riverboats, Lottie settled in San Antonio in 1865 and married another gambler named Frank Thurmond. Frank killed a man with a knife during a card game, and he had to flee without notice. Carlotta started searching for him throughout West Texas, making stops in Fort Concho, Jacksboro, Fort Griffin, and other rough-and-tumble frontier towns. She acquired the nicknames “Mystic Maud,” ”Queen of the Pasteboards” (pasteboards was another name for playing cards), “the Angel of San Antonio” and her most well-known moniker “Lottie Deno” during these voyages. By whatever name known, she was legendary for her prowess at the tables. She eventually reunited with Frank Thurmond and they settled down to a respectable life in Deming, New Mexico in 1882. They both swore off gambling altogether with Frank becoming the vice president of a bank while Carlotta became active in church life. She died in 1934. During Prohibition, one town became notorious for such trade. Galveston didn't just have a vice district; it pretty much was entirely a vice district and was jokingly called “The Free State of Galveston.” Long before Las Vegas, Galveston was where the casino action in the United States flourished. During one state investigation into gambling at the Balinese Room, a local sheriff was asked why he hadn't raided the establishment. The sheriff responded that it was a private club, and he was not a member. Even when state authorities decided to catch gamblers in action at the Balinese Room, they were thwarted because the walls contained secret compartments into which chips and cards could be hidden at a moment's notice. These shenanigans were slowly ended in the '40s and '50s as the government became serious about cleaning up illegal gambling throughout Texas. Yet, this set the stage for a development in poker that we're still benefiting from today. The Texan underground poker scene came into existence, and rounders like Doyle “Texas Dolly” Brunson, Thomas Austin “Amarillo Slim” Preston, and Bryan “Sailor” Roberts plied their trade by hitting the road and heading to wherever the juiciest games were rumored to be. The Poker Hall of Fame claims that one of these road gamblers, T. “Blondie” Forbes, was the inventor of Texas Hold'em. The Texas Legislature, on the other hand, passed a resolution declaring that Robstown, Texas, birthed the game in the early 1900s. Both of these stories have little historical documentation to back them up, and it's unlikely that either one of them is strictly accurate. What's undoubtedly true is that the game came into its own in the Lone Star State. There's widespread consensus that it was first brought to Vegas by Texan Felton “Corky” McCorquodale in 1963. By the time of McCorquodale's death in 1968, it had spread to most of the rest of the country as explained in this Life Magazine article from that same year. Had the Texas crew opted to play Stud or Draw Lowball instead, perhaps it would have been one of these other variants that initiated the poker boom in the early 2000s, or maybe there would not have been any poker boom at all. In 1996, the Kickapoo Tribe opened up a gaming facility that spreads poker, and this remains the only such casino poker venue in the State of Texas. However, beginning in 2015 or thereabouts, several membership card rooms began to conduct business. They charge daily, monthly, or annual membership fees and/or seat rental charges rather than rake, which they contend exempts them from the “economic benefit” clauses of the Texas anti-gambling statutes. Whether this line of reasoning will hold water in the long term is up for debate, but for now, they provide players in select cities around the state an additional way to play poker for real money. There is a lot that would need to happen for Texas to regulate any kind of real money online gaming. It is a conservative state that hasn’t even warmed up to the idea of commercial land-based casinos, which are more likely to come first before the authorities feel comfortable expanding into the online arena. While all the bordering states do currently have casinos, there has been very little real movement on this from the State of Texas, and so regulated online gaming seems like it would be rather far down the road, if at all. In 2013, State Senator Leticia Van de Putte and Representative John Kuempel introduced several bills for licensed online poker, but none of them made it past the committee stage. There hasn't been any other proposed legislation to establish a regulated internet poker regime in the state since. Texas has not been the most open to traditional gambling, but they do seem to be OK with forms of land based gambling that don’t really appear as much like gambling to the outside public. The state lottery, pari-mutual betting, and horse tracks are the biggest gambling enterprises in the state and that is fairly standard for states in the US. Charitable games, like bingo, are also permitted under certain circumstances. An unusual type of gambling machine allowed by the state is the 8-liner, a kind of video slot. People are allowed to maintain them on business premises as long as they pay out only in non-cash prizes and each prize is worth no more than $5. Abuse of the rules is commonplace, and a lot of police effort goes into shutting down operators who are violating the regulations. Texas only has one tribal casino that offers poker, the Kickapoo Lucky Eagle Casino in Eagle Pass, which has 12 tables and runs NLHE and LHE cash games daily. There are no commercial casinos, but a few cardrooms have sprung up that avoid the TX anti-gambling laws by charging membership and time fees rather than rake. If poker is regulated in the state of Texas it will be interesting to see how it would end up playing out, because Texas has a very large population, but none of the traditional gambling institutions in place. So who would control that market and how it would relate to what is already in the state is still very unclear, and it could change how gambling (both live and online) is approached overall in the state. There may be more prominent poker players from Texas than from any other state. This is only to be expected when we consider the long Texan history with the game, which extends back to the frontier days. Johnny Moss was a teenager in Dallas the 1920s, well before the advent of televised tournaments and life-changing prize pools. He was surrounded by cards even from a young age, and he even got a job attempting to suss out cheaters in poker games run by a local saloon. It wasn't long before Moss put the skills he learned observing the other players to good use, and he ended up becoming a “rounder,” traveling between Texas, Oklahoma, and Louisiana looking for the juiciest action to be had. It has been reported that he won more than a million dollars multiple times from poker sessions at the Metropolitan Hotel in Fort Worth. That possibly apocryphal marathon of poker was allegedly the inspiration for the World Series of Poker, started in 1970, though other events, like public poker games at the Flamingo and the 1969 Texas Gamblers Reunion, have also been credited as spawning the WSOP. Whatever its origins, Moss prevailed in the contest three times, taking home the inaugural trophy in 1970 following a vote of all the players and triumphing again in the Main Event freezeout tournaments in 1971 and 1974. T.J. Cloutier was also a legendary Texas road gambler, but he was active a bit later than Johnny Moss was, having been born in 1939 and taking up the game only after stints as a pro football player, serviceman in the Army, and oil rig worker. Cloutier has had amazing tournament success starting in the '80s and continuing until the present day. Indeed, T.J. tops the list of live poker tournament winners among people from Texas with more than $10 million to his name. One accomplishment that has eluded him, however, is victory in the Main Event of the World Series despite having finished in second place in 1985 and 2000. The same can't be said of Doyle Brunson who won poker's Big Game twice: in 1976 and 1977. Amazingly, his hole cards were T2 in the final hands of both tournaments, leading to this combination being referred to ever since as the Doyle Brunson. Some authors of strategy books fear that exposing their secrets will cause their opponents to get a bead on their game and thus adversely affect their results, but this doesn't seem to have occurred in Brunson's case. He has collected 10 World Series of Poker Bracelets, tied for second place with Phil Ivey and Johnny Chan and behind Phil Hellmuth's 14. Doyle has had 36 cashes in WSOP events and has accumulated more than $6 million in tourney winnings. 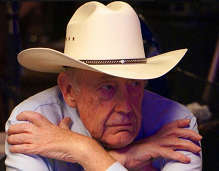 Doyle “Texas Dolly” Brunson has become the Godfather of Poker, having been around since the inception of No Limit Texas Hold'em and continuing to play at a high level despite being more than 80 years old. Indeed, he has cashed in the WSOP Main Event in every decade of its existence from the '70s to the '10s. He doesn't exactly court controversy or engage in verbal feuds against opponents like some of his peers (*cough * Phil Hellmuth *cough* Mike Matusow); yet, EVERYONE in poker knows who Doyle is, and a good many outsiders have heard of him too. These gentlemen are just three of the many Texan poker players who have left their mark on the game. An exhaustive list would be beyond the scope of this page, but here are the names of a few other notable poker players who have hailed from this state: Thomas Austin “Amarillo Slim” Preston, Bryan “Sailor” Roberts, David Williams, Ben Tollerene. Online poker in Texas is quite possible and could be profitable for you depending on how good you are. There are no laws prohibiting private individuals from participating in card games over the internet. The Texas online poker sites listed in this page are all conscientious organizations that wish to leave you satisfied, so select one of them and start playing today. If you are lucky enough to have another address in a nearby state, whether it be your business address, summer home, second apartment, family home, etc, you may have other online poker options available. 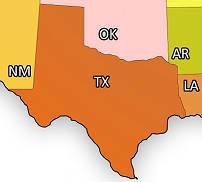 Here is a list of the states that border Texas and Professional Rakeback's review on each of them: Arizona, Arkansas, Colorado, Kansas, Louisiana, New Mexico, and Oklahoma. If you're looking for general info on the laws that pertain to poker in the United States and the sites that are available, then our U.S. poker players' guide may be right for you. You likely have friends or relatives who are interested in poker but who are ignorant of their legal options for playing online. Please share this article with them so that we can spread knowledge about the game we enjoy so much. Playing poker in Texas over the internet is pretty enjoyable, and we'd like to remove any doubts or concerns you have about it. To this end, we've presented below some of the most common questions and answers related to online poker in Texas. Are there any Texas-licensed internet poker sites? No, Texas has not established any legalized framework for online poker licensure. Live casino poker is viewed by industry experts as a precursor to state-regulated virtual gambling, and Texas is weak in this department with only a single tribal casino location offering poker within its borders. TX political leadership tends to be quite conservative, and so it will likely be quite a while before internet sites for poker appear that are approved by the Texas authorities. Is online poker legal to play in Texas? It's absolutely is legal to play online poker in Texas. Despite the fact that there are no licensed online cardrooms that have received the OK of state leaders in Austin, there are many offshore rooms that cater to Texans. They're based in jurisdictions where online gaming is totally legal, and they happily welcome residents of the state through their virtual doors. There's nothing in the Texas legal codes that makes playing a crime as long as you do it in a private place. Furthermore, with the 2011 reevaluation of the Wire Act by the Department of Justice, there's nothing at the federal level banning this activity either. Is PokerStars legal in Texas? It's perfectly legitimate to play on PokerStars from Texas, but unfortunately, it's not possible to do so except for play money. You see, PokerStars was one of the companies hit the hardest by Black Friday in 2011, and as part of the resolution of the case, it agreed to stop doing business in America except in those states where it has gone through the appropriate regulatory approval (like New Jersey). Thus, Texas citizens are unable to play at the world's leading online poker provider, which is true of the majority of the U.S. population as well. Is Ignition Poker legal in Texas? Yes, the Ignition Poker Casino room operates under well-understood trade rules by which foreign companies are allowed equal access to the markets of the signatories' countries. Thus, despite the restrictive banking and financial regulations sponsored by busybodies in Washington, D.C., the firm most likely considers its operations to be in full compliance with the law. Needless to say, you can enjoy the services of Ignition Casino Poker from the Lone Star State. Is BetOnline legal in Texas? Yes. BetOnline bases its international and multi-jurisdictional betting platform on World Trade Organization rulings that have found the United States to be in violation of its treaty obligations by going after offshore gaming entities. BoL accepts customers from all 50 states, Texas not the least among them. Is Global Poker legal in the State of Texas? We have our criticisms of Global's claims that its enterprise is completely legal in Texas and the remainder of the United States. While there isn't really enough space in this FAQ to go into detail on this subject, we have prepared a review of Global that discusses the problems we see with the firm's business model. What is the Texas minimum age for gambling? The lowest age at which someone is allowed to gamble in Texas is 21 for most types of gaming, including poker, although individuals are allowed to participate in charitable bingo, purchase lottery tickets, and engage in pari-mutuel racetrack betting at 18. Online, the same rules carry over, so you ought to be 21 or older to open up an account for real money poker. Most sites will let you sign up as long as you're at least 18 because they can't effectively monitor the relevant age restrictions in thousands of areas around the globe. It's up to you to ensure that you're in compliance with local law. Is it possible for me to run my own internet-based gambling business in Texas? It would be extremely foolish to try to set up an illegal online betting service inside the State of Texas. In 2013, investigators pulled the plug on an international sports betting ring that was headquartered in North Texas and allegedly booked more than $5 billion in sports bets. Eighteen men were arrested in connection with this enterprise. Importantly, none of the people charged in the case were ordinary bettors; it was those actually running the organization that were the targets. Unless you like to be in the crosshairs of state and federal law enforcement, it would behoove you to avoid getting mixed up in the illicit online gambling industry. How are poker winnings treated for tax purposes? Texas is one of the few states in the Union without any individual state income tax. Still, the Internal Revenue Service wants its cut of whatever profits you make while playing card games online. How to properly prepare the paperwork for your gambling earnings is a question that's best addressed by a competent tax attorney or certified public accountant. Are there any Mac-compatible internet poker rooms? Yes, many of our recommended sites have dedicated poker client downloads for Mac computers. Among them are Ignition Casino, Sportsbetting.ag, and 5Dimes. Even at rooms that don't specifically cater to Mac users, you may find web-based interfaces that work with any modern browser software, including Safari and other popular Mac packages. Windows emulation software, like Crossover Mac, is another option. Learn more about this topic in our roundup of the best Mac poker sites. Are there mobile-friendly online poker halls? Mobile gaming is a big moneymaker for all kinds of entertainment companies, and online poker firms are no exception. Some sites have apps that you must install to your smart device while others include mobile-compatibility through their web-play interfaces. Among the poker rooms that make it easy to play from your phone or tablet are Ignition, Sportsbetting.ag, and Intertops. However, be aware that most mobile poker solutions only carry a restricted menu of games, so you'll want to download the desktop program to sample the full gameplay experience. 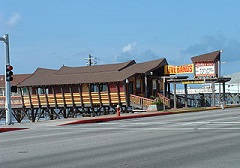 Are there any licensed live cardrooms in Texas? Through loopholes in the existing state gambling laws, a few membership-based private cardrooms have started to appear across the state. In some localities, they're even licensed by the local authorities. This is true in Houston, which the Post Oak Poker Club calls home. These clubs charge membership fees rather than rake, and in most cases, are cheaper than playing in a traditional casino. Their legality has come into question, though, and decisions by state lawmakers, the courts, and the attorney general may have an impact on whether or not they can continue to operate going forward.